Niki at the 1998 Llama Wood's Sale in Bend Oregon. The llama is LW Gucci. Gucci a *Kissam son and was the high selling llama of the sale at $135,000. Niki at the 1997 Northwest Classic ALSA Show and Sale. The llama is Kaleiko who was by King Crimson. Niki also showed the first place class six female! Niki with LW Lovely Louise at the 2000 Spring Celebrity. Louise was sold by Donna and Linda from Llamas and More Catalog Store. Louise sold for $17,500.00 to Grace Avery at Raccoon Ridge Llamas. 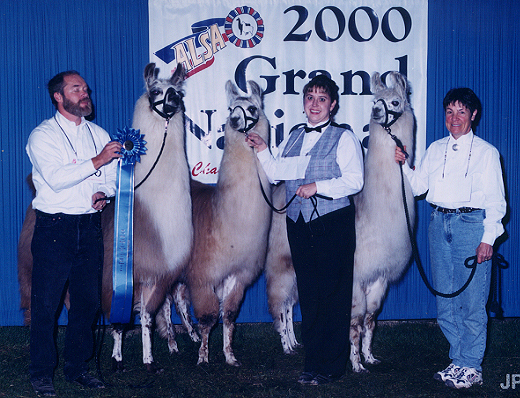 Niki with PPF Prancero (whom she sheared) at the 2000 Spring Celebrity. He was owned by Pam Clark and Victoria Ginsberg. Prancero sold for $11,000.00 to Barry and Carla Throgmorton at Cielo Vista Llamas. Niki and Eagle with friend Lenore at the 1999 King County Fair. 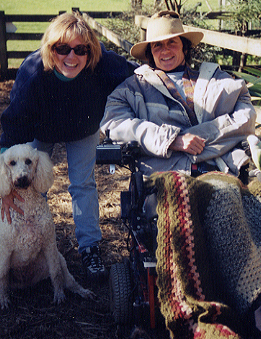 Niki with Julie Insley of Rangemore Llama Farm in New Zealand Summer of 2002. Julie was responsible for Niki and Jeff doing the clinics in New Zealand. She also had a Standard Poodle named Lily. Niki with the group of her Auckland New Zealand clinic. Wonderful people! Niki and dear friend Joanne Shook helping Ken Austin (Rain Dance Ranch) at the 2000 Nationals with his first place Get of Sire for Peruvian Pardo!